Every spring and early summer in Washington, D.C., tourists descend like a loud, credit card-wielding horde of locusts. They fill up the National Mall, double or triple restaurant waits, pack into Metro cars like sardines, and send Uber surge prices soaring. They also ask for directions. This can be confusing where hotels are concerned because several chains have more than one location in or near the city. Long-term residents come up with nicknames to keep them straight. There is one D.C.-based Hilton on Connecticut Avenue, north of Dupont Circle. It’s known as the Hinckley Hilton. President Ronald Reagan had addressed an audience of union members of an AFL-CIO-affiliated convention there on March 3, 1981. He was trying to drum up support for tax cuts and budget reductions. It was a tough crowd, but Reagan tried his best. When the president and his people were outside the building, heading for the cars, six shots were fired. A failed and crazed songwriter named John Hinckley unloaded the contents of his Röhm RG-14 revolver into Reagan, White House press secretary Jim Brady, policeman Thomas Delehanty, and Secret Service agent Tim McCarthy. Most of the events of that day have been widely reported. A few of the more memorable details were the heroics of agent McCarthy, who jumped into the line of fire; Reagan’s insistence on walking into the George Washington University Hospital rather than being carried in on a stretcher; his dramatic collapse inside the building; the bullet exploding in the laboratory after the doctors dug it out of him; and, of course, the theatrics of Secretary of State Al Haig. That would have been innocuous on its own. Unfortunately, Haig was genuinely confused about the line of succession, and he made the mistake of broadcasting his ignorance. Haig believed he was third in line for the presidency and told this to reporters. This was interpreted as a power play at the worst possible moment. It wasn’t feasible for Reagan to fire him on the spot, but Haig was forced out the next year. Where was Bush during all of this? He had been dedicating a historic site in Fort Worth, Texas. He was returning by plane to D.C. when a confusing message came in over the transom. Network broadcasts clarified things for the passengers of Air Force Two: the president had been shot. That restraint was as commendable as it was hard to explain, except as an outgrowth of Bush’s character. Bush had been twice considered for vice president—in 1968 and 1974—but he was passed over in favor of Spiro Agnew and Nelson Rockefeller. Bush had been far from Reagan’s first choice in 1980, and the two were never what you would describe as “close.” He ran against Reagan in 1980, and there were a number of memorable primary scrapes between the two. “Voodoo economics” was how Bush described Reagan’s proposal for tax cuts that would be at least partially paid for by increased economic growth. Reagan’s “I am paying for this microphone!” riposte was in response to Bush ordering the moderator to cut his opponent off. 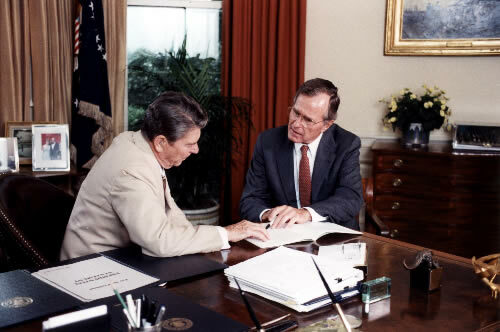 After being mocked by Reagan as a “Brooks Brothers Republican,” Bush thought he could score points by opening his jacket to reveal the label of J. Press. By the end of the primary campaign season, Reagan wanted nothing to do with “Mr. Résumé.” But the résumé was impressive: Phillips Andover Academy; youngest pilot in the history of the Navy; a service record that included a Distinguished Flying Cross and three Air Medals; Yale; Skull & Bones; founder of Zapata Oil; three-term congressman from Houston, Texas; ambassador to the United Nations; head of the Republican National Committee; liaison to the People’s Republic of China; director of the CIA; chairman of the First National Bank. The man most responsible for Bush becoming Reagan’s running mate was Gerald Ford. Reagan wanted Ford for vice president, but Ford had already been vice president and wasn’t wild about the job, especially under a man he had decided against for vice president and running mate in 1974 and 1976. Amid all the talk of Vice President Walter Mondale’s expanded role as veep, Ford asked for more, both in private and in public. Ford wanted a large say in foreign policy. He even wanted some control over Cabinet appointments. The usual chorus of television talking heads started to get excited about the possibility of a “co-presidency.” Reagan told him nyet, as he would tell Gorbachev several years later. That was probably the right call politically, but it created a problem. The former governor of California was conservative and stubborn, but he knew that without Ford he still needed a Republican who could convince (1) moderate Republicans that they would have a place at the table and (2) D.C.-establishment types that they could work with a man that many thought crankishly right-wing. The Reagan team eventually decided in favor of the man whose campaign had boasted of “the best résumé in America.” In the general election, they made short work of President Jimmy Carter and his outsized VP Mondale, crushing them 489 to 49 in the electoral college. Public eulogies are normally jam-packed with fulsome insincerity, but there is no reason to doubt that Bush was speaking anything other than what he knew to be the truth. Bush was a loyal servant of Reagan. Reagan repaid him with a serious effort to make Bush his successor. The two didn’t see eye to eye on a lot of things, but Bush had come Reagan’s way on the ones that mattered. He switched from a terse pro-choicer to awkward pro-lifer, supported Reagan’s defense buildup and the outlines of his economic plan. “Read my lips, no new taxes,” Bush promised. Some conservatives were shocked and upset with Reagan for supporting Bush, but they shouldn’t have been. Before the down-to-the-wire 1976 Republican convention, Reagan had announced that the moderate-to-liberal Pennsylvania Senator Richard Schweiker would be his vice president. In a private audience, several Reagan supporters urged their candidate to dump Schweiker and announce a new number two. They argued it was necessary—the only way to secure the nomination. Reagan rejected their proposal and shamed them for making it. He later named Schweiker to head the Department of Health and Human Services. Reagan was a conservative, but he was also a partisan Republican who was capable of great loyalty. His track record of loyalty made the notion that he wouldn’t support Bush absurd. He did, and Bush won, beating Massachusetts Governor Michael Dukakis handily, though not by the 49-state rout that the Reagan-Bush “Morning in America” campaign managed to roll up in 1984. The victory was so much sweeter for Bush because the man the Democrats nominated for vice president, Lloyd Bentsen, had beat out Bush for a Senate seat in 1972. “Senator” was one of the few jobs that Bush was never allowed to add to his résumé. He had to settle for South Lawn landing privileges instead. Jeremy Lott is author of The Warm Bucket Brigade: The Story of the American Vice Presidency. Bittersweet memories of Bush Sr. A kind,decent man, a patriot and a wonderful father whose presidency started out with so much hope in the form of the fall of the Iron Curtain and the victory over Iraq but shortly thereafter would crash and burn. But I think Senator Paul Laxalt turned down an offer from Ronald Reagan after President Ford had been ruled out.